Journalist David Samuels' collection of essays, extended and short, Only Love Can Break Your Heart, was published earlier this year. It is written, appropriately for Samuels' profession, in a terse style, but with felicitous and Menckian choices of phrase. 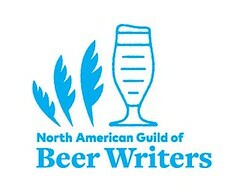 The Brewers Association (you knew I would veer back to beer) annually recognizes "outstanding media coverage that increases beer drinkers' understanding of the diversity and flavor of American craft beer." It honors short forms in consumer print media, consumer electronic media, and trade and specialized beer and brewing media. But it ignores the longer forms — books. Michael Jackson, our beer Samuel Johnson, was first and foremost a writer of books, of beer literature. Should not an award named for him —the Michael Jackson Beer Journalism Awards— also recognize those whose beer writings are indeed books? 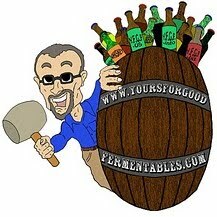 Bob Skilnik, an author of two books on beer, asks just this question at his blog. Somehow, I think Jackson would even question this program in its current form; “The Michael Jackson Beer Journalism awards is the only program of its kind. The contest allows the craft beer community to acknowledge, reward and thank journalists who feature craft beer.” Except for book authors. If the Brewers Association can't help, Bob suggests creating a separate award for books- on-beer, as there once had been. Read more here. I think it's a good idea. Whether few or many, words written well, in furtherance of our thing called beer, should be treasured and nurtured. Of course Bob Skilnik would like the recognition for his books, as any author should. But his point is valid: why does the Brewers Association fail to honor beer literature? I once stepped out of a office and used my cell phone to call the person to whom I had been speaking, after he had interrupted our face-to-face business conversation to take a business phone call. I tell my customers and clients that email is the preferred manner with which to contact me. Although this may seem to be a tautology, I answer emails at the time of day when I have the time to do so (usually early in the morning). I recently had a discussion with a brewer at a small brewery that is now partly owned by Anheuser-Busch. Many of his days are devoted to responding to a barrage of emails from A-B managers, many asking the same questions or for the same reports, sometimes weeks after the fact, and many of whom he doesn't even know. The above NY Times article might be of assistance to Anheuser-Busch, especially in light of their recent announcement of $1 billion of cost-cutting. There is schadenfreude in observing Anheuser-Busch's frenzied efforts to stay independent. After all, what the Belgian-Brazilian conglomerate InterBrew is attempting to do to A-B, A-B has done to others ... for years. Yet, there is room for real concern. A foreign sale of an iconic American brand is an actionable metaphor for the diminishing international influence of the brand of America itself. There are some recent interesting developments. InBev began taking legal steps Thursday to replace Anheuser's board, seeking a court ruling in Delaware clarifying that Anheuser shareholders could oust all 13 directors by written consent without cause. Contrary to earlier reports, A-B has announced that it will NOT sell its Busch Garden amusement parks. A-B has warned that InBev will cut jobs (which indeed InBev has done in aggressive fashion at previous purchases). Ironically, that is what A-B itself has announced it will do itself to save $1 billion dollars in operating costs by 2010. It also announced that it will raise prices and buy back shares. A-B says that InBev, with its cash proffer of $65-a-share, has undervalued the company. There are rumors, however, that a bid in the $70s-per-share might be acceptable to the board. Anheuser prefers to reflect the value of both Modelo and Tsingtao, however. Including those holdings, it says InBev's offer is only worth 11.5 times Anheuser's 2007 Ebitda [earnings before interest, taxes, depreciation, and amortization]. What's more, it puts the value of other recent beer deals, including the purchase of Scottish & Newcastle PLC by Heineken NV and Carlsberg A/S in the 13-14 times Ebitda range. It's a summer bounty of good beer in the Old Dominion. Ten miles further west than, and one month after the Northern Virginia Summer Brewfest, it's Magnolias at the Mill First Annual Beer Festival on Saturday, 19 July. Magnolias is a 30 beer tap restaurant, built in a converted mill in the small farming town of Purcellville in western Loudoun County. Some of our very favorite breweries will join us for a festive day of awesome beer, music, and barbecue. ... More to be added. (Attendees subject to change, but the guaranteed good time is not!) Tickets include a souvenir glass and five beer sample tickets plus Chef Mark's Barbecue Feast. Clipper City Brewing Company will be there ... pouring Red Sky at Night Saison, Hang Ten Weizen Dopplebock, and Oxford Organic Raspberry Wheat. It's a wonderful excuse for a bicycle excursion. The restaurant's patio sits only a few feet from the western terminus of the nearly 50-mile Washington and Old Dominion Railroad Regional Park, a biker/hiker trail which can be traversed from the Washington D.C. National Mall to Purcellville. Festival hours: 11am-6pm. More information and tickets here. UPDATE: Photos of the fest here. Related story: Say no to lawnmower beers. The July issue of Washingtonian Magazine is always the "Best of" issue. This year they asked the beer directors of two Washington-area restaurants, Bill Catron of Brasserie Beck and Greg Engert of Rustico, to select the best beers to accompany lobster, steak, burgers, and crabs. In other words, Brews for Summer Food. Baltimore's Clipper City Brewing has done well with the editors: best overall local brewery in July 2006, for example. And this summer, Bill and Greg have selected Clipper City's Small Craft Warning Uber Pils as a quenching beer when eating Chesapeake crab. The rounded, rich, malty center contrasts with—and cools—the spice of the Old Bay seasoning, while the snappy, floral hop finish balances the sweetness of the crab. Why, and what were the other selections? Caveat: I work for Clipper City Brewing Company. After six and a half years with Gordon Biersch Brewery Restaurant in Washington, Friday the 27th will be my last day at GB. I am moving to beautiful Nelson County Virginia and will be involved in the start-up of a new brew pub called Devil's Backbone Brewing Company which will sit in the shadow of the Blue Ridge mountains just down the road from Wintergreen ski resort. When down in central Virginia, please make it a point to stop by. We plan to be open this fall, around October November. For more, see yesterday's blog post. [UPDATE: 2008.07 Photos of brewery under construction. The Wall Street Journal reports today that the Anheuser-Busch's Board of Directors will reject the Brazilian-Belgian conglomerate's $46.35 billion acquisition tender. InBev, it is assumed, will then take the battle directly to A-B's stockholders. cost-cutting of $1 billion over the next 4 years. sell all of its packaging operations (! ), that is, bottling, canning, and kegging. Modelo also is a fiercely nationalistic [Mexican] company that wants to remain independent. 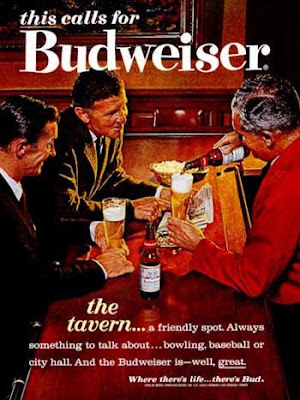 And, relations between the brewers have been frosty at times over the years, mostly because Modelo executives felt Anheuser got half the company too cheaply. Good news was reported from Utica yesterday: "We're alive, we're going to be well, and we're here to stay," said Matt Brewing's Vice-President Fred Matt. As reported at the Syracuse Post-Standard, recovery is moving forward at the upstate New York brewery, since fire gutted its canning plant on 29 May. The bottling line - which cranks out the Saranac beers - survived, but it's taken nearly a month of cleanup and restoration to get it in shape. The brewing area was not affected. Meanwhile, the brewery's been kegging some Saranac, but the tanks are still full, waiting for bottling to resume. Some Saranac flavors, such as the best-selling Pale Ale and the increasingly popular Pomegranate Wheat, may temporarily disappear from some store shelves. But Matt expects production to get back on schedule within a few weeks of the bottling line's restart. Only ONE restaurant in the DC/Baltimore area has ever followed the lead of Garrett Oliver and conducted a beer vs. wine dinner. That's a dinner in which each course is matched with a beer and a wine, and the diners vote on the better pairing. That one restaurant was Colorado Kitchen. In 2007, Chef Gillian Clark called her take on the dinner idea The Battle of the Barrels. Sadly, Chef Gillian Clark has just announced that she will be closing the Colorado Kitchen. Read more about her plans. In September of 2005, while at restaurant Cafe Saint-Ex, Chef Barton Seaver put together a Tomato and Beer Dinner as a coming-out party for the then brand new Loose Cannon Hop3 Ale of Clipper City Brewing Company. Seaver was intrigued by the herbal character of the Loose Cannon, and proposed pairing a fresh cask of it with a tomato-based dessert. When I appeared momentarily skeptical, he laughed. "That's why I'm the chef and you're the beer guy", he said. Go here to see what he created. Seaver left Cafe Saint-Ex to open an award-winning sustainable-seafood restaurant called Hook. Now, in a plotline worthy of television's Hell's Kitchen, he's just resigned his position at Hook. More at the Best Bites blog at the online Washingtonian. Jump here for a post on the departure of a long-time fixture of the DC brewing scene. Embargoed until Wednesday 25 June at 5:30 PM. I am writing because, as I'm sure you all know, Jason Oliver will be leaving Gordon Biersch sometime in the very near future for a position in Wintergreen Mountain, VA. Jason has been an immeasurable asset to our company and we are very sad to see him go. However, we also know that this is an incredible opportunity for him and want to send him off in style, the only way that would be appropriate. Festivities, including a costume contest and a buffet to benefit Special Olympics, will be from 5:30-7:30. Jason will tap the keg on the later end of those two hours. Per tapping party tradition, I'm sure the celebration will extend to around 10 or so.... The theme is 80s, so break out those tapered jeans and fluorescent tops! It will be at the Gordon Biersch on 9th and F streets in downtown D.C.
be even more memorable if we can manage to keep it a secret that all of you will be present! My Clipper City work pulls me elsewhere tonight, but I wish Jason gratitude for the phenomenal brewing he has done in the DC area. In a milieu of extreme beer, he has continued to brew beautiful beer. Pink wines are made from red grapes that are allowed to ferment for a much shorter time than for red wines, so the grape skins spend less time leaching their color into the juice. The process (which the French call saignee, derived from the verb meaning "to bleed") is halted when the wine is merely light to dark pink instead of red. I think that this description may be a bit misleading. Fermentation of rosés is not necessarily shorter than that of red wines, even though the aging may not be nearly that of the decades-long of a Bordeaux. It's the contact time of the red grape skins in the pressing that makes the difference. Saignée, or bleeding, is used when the winemaker desires to impart more tannin and color to a red wine, and removes some pink juice from the must at an early stage, in a process known as bleeding the vats. The removed juice is then fermented separately, producing the rosé as a by-product of the red wine, which is intensified as a result of the bleeding, because the volume of juice in the must is reduced, and the must involved in the maceration is concentrated. Blush wines such as California's white zin are typically off-dry (slightly sweet) to sweet in flavor. However, rosé wines tend to be drier than dry and are made around the world.Even far outside their spiritual homeland in Provence, spicy rosés are a staple of summer drinking. Read more with the authors' specific rosé wine recommendations here. 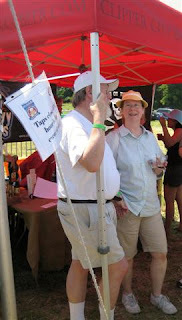 At the recent Northern Virginia Beer Festival, I enjoyed a tasty Virginia rosé. Out of the many brewery tables at last weekend's Northern Virginia Summer Brewfest, there was one booth sampling that other fermented beverage. Representatives of Kluge Estate Winery and Vineyard had driven up from Charlottesville, Virginia to pour three delicious wines: Albemarle Viognier, Albemarle Simply Red (a Bordeaux-style blend), and Albemarle Rosé. All three wines had been aged in oak; the last, a French-style rosé, showed a bright berry fuitiness and dry tannic finish. A great bone-dry summer refresher: I went back for seconds. The winery representative told me that several festival goers had told her how happy they were to find wine at a beer festival. I smiled. At wine festivals, I feel the same way, but in reverse. The contrast proves refreshing. The Virginia Department of Alcoholic Beverage Control tried its hardest to ban them last year, but it failed when the Virginia General assembly intervened. And what was it the ABC attempted to prohibit? Beer popsicles, or Brew Pops, to be more precise. Brew Pops will make their triumphant return at Alexandria restaurant and beer bar Rustico on Tuesday 1 July. The restaurant will be offering seven flavors during the summer-only run: framboise (raspberry), kriek (cherry), peche (peach), cassis, banana, plum, and chocolate stout. The brainchild of Executive Chef Frank Morales and Beer Director Greg Engert, the icy dessert ruffled the feathers of the Virginia Department of Alcoholic Beverage Control (ABC) last year. Citing a variety of conflicts, ABC prohibited Rustico from selling its popular brew pops. Thanks to a bill sponsored by Del. Adam Ebbin, D-Alexandria, and Sen. Patsy Ticer, D-Alexandria, that amended the ABC's law on alcohol content in prepared foods, Rustico is able to sell its brew pops once again. "Seventy-five years after the end of Prohibition, I am glad that we are finally making reasonable modifications to Virginia's Alcoholic Beverage Control laws," said Ebbin, a co-sponsor of the bill. "As long as adults consume responsibly, government should certainly not over-regulate the inclusion of alcohol in food -- or brew pops for that matter,"
Get 'em now while it's hot and they're cool! There's a non-resolution resolution to the recent flap caused when the Associated Press attempted to crack down on what it considered un-fair use of its published stories. In a statement Friday, Rogers Cadenhead said he is "glad" the dispute over his site, the Drudge Retort, has ended. He said a larger conflict remains between AP's view of acceptable use of its content and the practices of many bloggers. Cadenhead declined to comment further, referring all questions to his attorney. An AP statement Thursday night said the company had provided additional information to Cadenhead about posting its material online, and both sides considered the matter closed. It also said the AP was having a "constructive exchange" with a "number of interested parties in the blogging community" about the relationship between bloggers and news providers, and intended to continue the dialogue. Earlier this month the AP sent a legal notice ordering Cadenhead to take down seven entries on the Drudge Retort, his takeoff on the Drudge Report. The news agency said the postings were violating the AP's copyright. Cadenhead highlighted the disagreement in his personal blog, http://www.Cadenhead.org, and prominent bloggers rallied behind him, saying the posts in question were protected under the "fair use" provision of copyright law. That allows quotation of copyright material for commentary and certain other purposes without asking permission. In response, the AP said it was working to develop guidelines for what it considered permissible use of its content by bloggers. Call it Washington D.C.'s Permission for the Proper Address rule. DC has prohibited single beer bottle or can sales in certain areas of the city and is considering expanding that prohibition to other areas. The ostensible point is to reduce loitering and public drunkenness. Many higher alcohol beers, such those insipid 'malt liquors', are sold in larger portion (often 40 liquid ounce) single containers, cans, or bottles. Over the last few years a number of ANCs and Wards -- including a stretch of H Street NE, part of Logan Circle, and wards 4, 7 and 8 -- have banned the sale of single cans and bottles of beer, citing their tendency to cause their drinkers to pee on sidewalks, litter, and generally make trouble. Now the Examiner is reporting that Council members Jack Evans (D-Ward 2) and Tommy Wells (D-Ward 6) would like to see bans on single alcohol sales imposed in their respective domains. Evans is looking to ban singles in Shaw, Thomas Circle, Logan Circle and part of Penn Quarter (that's ANCs 2C and 2F), while Wells’ bill is for all of Ward 6. Both Evans and Wells have included a provision that would allow stores to enter into voluntary agreements with their ANCs to continue the sales of single beers. This sort of provision, like the in place in Logan Circle that allows the Whole Foods on P Street to sell single craft beers without restriction, has caused cries of double standards along racial and class lines in the past. It's an amusing sight in DC liquor stores which don't get exemptions and yet still sell large bottles of craft beers and imports such as Belgian beers. The stores will shrink-wrap two 750-ml bottles together to create a two-pack, thus satisfying the prohibition against single bottle sales. Laws against public drunkenness, loitering, and disturbing the peace already exist on the books. I first read about these proposals of City Council members Evans and Wells at Living in the District, a blog published by one of my fellow members of the DC-area Bloggers Meetup. Substitute the wine-words with beer-words, and you might think that the LA Times piece below was about beer, not wine. There's similar silliness in the beer world, whether it's beer styles or beer reviewing. And as with better wine reviewing, better beer reviewing begins with homework. Learn to identify the 5 basic tastes (sweet, sour, salty, bitter, umami), the aroma of hops (floral, grassy, citrusy), the aroma of lager fermentation (sulfury), the aroma of ale fermentation (green apple), the taste of malt (bready, toasty, caramel, coffee), and gasp, yes, the off-aromas of beer. A bartender said to me yesterday, "I don't like it. It has an aftertaste." I thought in response, "I hope so!" What he meant to say was that he didn't care for that particular aftertaste. But I disagreed, silently, as I took another sip of the Sierra Nevada Summerfest. Drink to enjoy, not to impress. It's more rewarding. Hmm I'd say it's the pretentious twit who reads the original notes and says "Ah yes, I also identified the 'wet dish towel' and '1970 Chevy Malibu interior' notes. I attended The Washington Blogger Meetup last evening at RFD. It was my first meeting with this DC-area group for "blog writers, readers, and retired bloggers of all stripes." The Meetup has over 400 members; our group last night was comprised of about a dozen. This did promote more one-on-one conversation. A person even two chairs down would have to shout to be heard; RFD was packed to the gills. Most were hi-techers with much greater skill at such than I would ever hope or want. But among the group there was a comedian, a political website developer, a DC scene observer. No one seemed particularly worried about the Associate Press' recent hamfisted attack on bloggers' use of source material references. One of the more valuable things I learned? Always check, and double-check your URL (that is, the address, for your website or blog). In my profile for this group of bloggers, I had typed the address for my blog --incorrectly. I photoshopped the photo a bit for clarity. It was taken at the Meetup on a Mac by Joe of the Dumb Things I've Done Today blog. More of his pics here. A few months ago, a newspaper reporter interviewed me for a story about craft beer. After we were finished, I offered to buy the reporter a beer. He thanked me but politely refused. I work for the Clipper City Brewing Company and, in that capacity, I was to be quoted in the piece. So, my gesture —a $5 pint— could have been perceived as a conflict of interest. Earlier this week, the Associated Press (AP) delivered several cease-and-desist orders to a blog site at which bloggers had quoted AP stories. Jim Kennedy, the AP's director of strategic planning, said Monday that he planned to meet Thursday with Robert Cox, president of the Media Bloggers Association, as part of an effort to create standards for online use of AP stories by bloggers that would protect AP content without discouraging bloggers from legitimately quoting from it. Short quotations of copyrighted material are allowed under the "fair use" provision of copyright law, but the law can be murky, Cadenhead said. Without the AP —and other news organizations— much of the original reporting to which we bloggers react and reference would not be available. But the issues of copyright, blogging, freedom of speech, ethics, and the Digital Millennium Act all seem to intersect in the AP's legal action. Above, I've quoted approximately 150 words from the Associated Press story. I think those four paragraphs were essential to relating the 'gist' of the piece. And I've linked them back to the original article. Is that fair use? To understand these and other matters of blogging, I'll be attending my first DC-area Washington Blogger Meetup later this evening. And here's an earlier post about another area of ethics in beer journalism. We enjoyed a pint of saison apiece. And each paid for his own. From Jeff Alworth at Beervana come these observations about international conglomerate InBev's $46 billion bid for Anheuser-Busch, the third-largest foreign purchase of a U.S. company but the biggest all-cash deal. As the hops and barley crisis have shown, small breweries can be seriously affected by brands against whom they don't compete. The hops markets, in particular, are global, so the Lucky Labs [brewery/pub in Portland, Oregon] of the world have a stake in this thing. Craft breweries have little juice to swing deals for hops, and many of the little guys are left on the outside. With InBev controlling some massive percentage of the world's beer production, this seems like a scary proposal. Then there's the institutional advantages afforded by having such a huge stake in the market. Recall my recent post on distributors--InBev's bid would make A-B distribution deals all that much sweeter. In markets on the West Coast this won't be as big a deal as it will in smaller markets. Finally, what about breweries in other countries? If InBev is trying to increas Bud's reach internationally, that means aggressive marketing that will overwhelm many small, venerable national brands elsewhere. The rapacious tendencies of InBev might become very much in evidence at the wholesale/retail level. Overt and covert pressures might force many craft beers off the shelves, especially in supermarkets. Independent wholesalers could be hurt in much the same way. The flooding in Iowa will remount price pressures on corn. As the need for grain for animal feed increases, price pressures will redound to barley -- feed and malting varieties. Flex fuel prices will feel upward pressure. And so on. Since June 6, Iowa has gotten at least 8 inches of rain, following a wet spring that already saturated the ground. As of Friday, nine rivers were at or above historic flood levels. More thunderstorms are possible in the Cedar Rapids area over the weekend, but next week is expected to be sunny and dry. Gov. Chet Culver declared 83 of the state's 99 counties disaster areas, a designation that helps speed aid and opens the way for loans and grants. The drenching has also severely damaged crops in America's No. 1 corn state and other parts of the Midwest at a time when corn prices are soaring. Dave Miller, a grain farmer and director of research for the Iowa Farm Bureau, estimated that up to 1.3 million acres of corn and 2 million acres of soy beans — about 20 percent of the state's overall grain crop — had been lost to flooding. On the Chicago Board of Trade Friday, corn prices hit a new record high of $7.3175 a bushel, while soybeans traded near record highs, closing at $15.60. Corn prices have climbed about 10% in the past week, threatening to put further upward pressure on food prices that have been climbing for a year. Expectations for tighter ethanol supplies because of higher corn prices could increase demand for gasoline, in turn helping to force up gas prices. The squeeze on ethanol also could heighten calls for the federal government to suspend its requirement that nine billion gallons of biofuels be blended into gasoline by the end of this year. To assist the displaced victims of the floods: Network for Good. Beer is food. Drink your 'food' FRESH! It's a growler of Stone Brewing's Imperial Russian Stout, filled only a few days ago, flown from Escondido, California to Alexandria, Virginia, and happily enjoyed at Rustico Restaurant. You know things are happening, or rather, already have happened, when a story appears in the Washington Post. Belgian Brewer InBev is offering a big payday to shareholders of Anheuser-Busch Cos. Inc., but its bid to create the world's largest beer company is already facing a major obstacle — U.S. election-year politics. InBev SA, whose brands include Beck's and Stella Artois, delivered an unsolicited all-cash bid of $65 a share for Anheuser-Busch, which makes Budweiser, Michelob and Bud Light. That's well above the St. Louis-based company's closing share price of $58.35 Wednesday. I do find it ironic that is a Republican official —Missouri Governor Matt Blunt— who is threatening governmental interference with the free practice of enterprise. Republican Gov. Matt Blunt said Wednesday he opposes the deal, and directed the Missouri Department of Economic Development to see if there was a way to stop it. "I am strongly opposed to the sale of Anheuser-Busch, and today's offer to purchase the company is deeply troubling to me," Blunt said in a statement. Web sites have sprung up opposing the deal on patriotic grounds, arguing that such an iconic U.S. firm shouldn't be handed over to foreign ownership. One of the sites, called SaveAB.com, was launched by Blunt's former chief of staff, Ed Martin. "Shareholders should resist choosing dollars over American jobs," Martin said in a statement Wednesday night. "Selling out to the Belgians is not worth it — because this is about more than beer: it's about our jobs and our nation." the remainder of the Associated Press story from which the Post wrote its. The Belgian-Brazilian brewing conglomerate InBev is going after Anheuser-Busch and its Budweiser empire. The offer of $46.4 billion, or $65 a share, amounts to a 14% premium over Anheuser's closing share price on Tuesday, though InBev says it represents a 35% premium over the 30-day average for Anheuser stock before deal speculation boosted the price, as The Wall Street Journal reports. A takeover by the world's No. 2 brewer in terms of volume of the No. 3 would supplant British-based SABMiller as largest global purveyor of beer, with a combined annual net sales total of about $36 billion. There are a lot of people in the good beer business who aren't the 'rock stars', who don't receive the renown or notoriety, but who are as crucial to the success of good beer. Bar owners and bar managers are such, at the front lines every day. And Chris Pons was one of them. During the 1990s and through early 2004, the Last Chance Saloon, a long-time fixture in Columbia Maryland, was a good beer mecca, in fact an East Coast destination point for better draft beer. To no small measure, instrumental to its success was Chris Pons, its beer manager during the 1990s. He aggressively featured the new local beers and, at that time, the hard-to-acquire West Coast beers and imports. In fact, under Chris's stewardship, the Last Chance Saloon became one of the pioneering bars to feature cask ale. He was an active supporter of the Oxford Brewing Company, Maryland's original microbrewery, and for whom I worked at the time. Chris died earlier this week. He was a young man. While Canadians continue to buy more beer than any other alcoholic drink, wine is becoming increasingly popular. But lest this become a zero-sum game, a winner-takes-all-battle in which the losing beverage goes home empty handed, it’s worth noting that Canada's overall alcohol sales rose by 4.9 % in 2007. Lets just declare this a victory for fermented liquor. 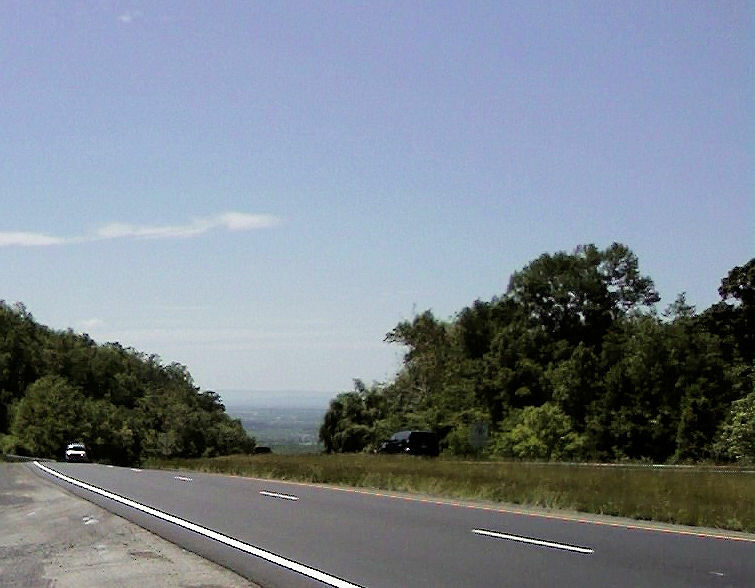 That would be 102 degrees Fahrenheit: the late-afternoon temperature on Monday 9 June 2008 on the road north from Fredericksburg, Virginia. I drive a lot; I'm a salesman for the Clipper City Brewing Company. Jeff Wells, known to his friends and others as Hoppy Jeff, is a long-time enthusiastic fixture of better beer in the mid-Atlantic. 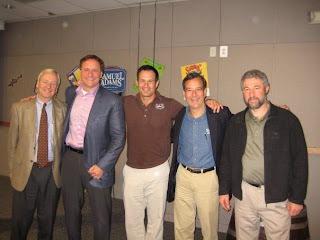 During the early and mid aughts (that's the 2000s), first at Whole Foods, then with Craft Brewers Guild/Global Brewers Guild, Jeff was a tireless promoter of the good life of good beer. Then he left for New York a couple of years ago. And now .... he's back! Jeff will be taking up where he left off, but with local distributor DOPS based in Fort Washington, Maryland. He'll be a competitor, but with his joie de bière, we wish him well and welcome him back. Josh Mishell of Flying Dog Brewery has put a nice 4 1/2 minute video on SAVOR up at his personal site, Bank Gothic Overload. SAVOR may have been the first ever national exhibition of beer-with-food, held mid-May in Washington D.C. The sponsoring group was the Brewers Association, the national advocacy group for small breweries. I have a small write-up here. If you look closely during the first scene of the crowds entering the Mellon Auditorium, you'll catch a glimpse of Fred Lewis. He's wearing the biege suit. Fred is a long-time demiurge of the Washington DC beer scene. Well before good beer was a a given in our area (think 25 years ago! 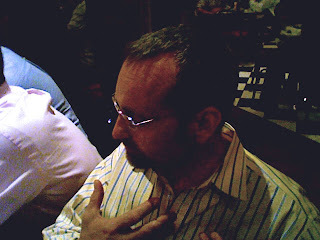 ), Fred was hosting many beer events at the Old Europe in Georgetown, and still occasionally does so. There's also an amusing shot during the the interview with Sam Calagione of Dogfish Head. Look over his shoulder and you'll see the caterers chowing down big-time! Savor - An American Craft Beer & Food Experience from Flying Dog Brewery on Vimeo. I have a sister. She has a blog. In her latest entry, she mentions an attempt to render collard greens edible. It involves a Community-Shared Agriculture co-op. And bacon. And a bottle of Sam Adams Cherry Wheat. ADM's premise is wrong. Collards are hardly inedible. Not only delicious, they are cheap, easy to prepare, and ridiculously healthy. So get over that! Clean the greens of any grit. Remove the stems. Coarsely chop the greens, or as ADM's sister does, chiffonade them. Put in a large soup pot. Add beer, and enough cool clean water to cover. Now simply simmer for 30 minutes. Don't overcook! Drain. Then, toss the warm greens with Kosher salt, freshly cracked black pepper, balsalmic vinegar (which cuts the bitterness of the greens), and your favorite hot sauce, all to taste. Serve with a (small) dollop) of soy margarine, or more balsalmic. Easy and quick (and inexpensive) ... and good over rice. The beer, when simmered, will add a yeasty flavor, similar to the dried yeast you'll often find in prepared soup mixes, but with a hint of hops. But avoid heavily hopped beers, which would impart unneeded bitterness to the greens, and ales which will add a distracting fruitiness. Any good honest American Lager will do, such as Victory Lager, Dominion Lager, or Sierra Nevada Summerfest. Avoid North American industrial lagers (N.A.I.L.s) such as Budweiser, Miller Lite, etc., which are produced with non-barley adjuncts. Why 6 ounces? You don't want to overdo the flavor, but only to add subtle hints. And, a half bottle will remain for the thirsty cook. You may have heard that Oprah is in the middle of a vegan experiment, as part of a 21- day alcohol, gluten, caffeine and sugar-free cleanse. On Day Two, she writes in her blog: "Wow, wow, wow! I never imagined meatless meals could be so satisfying." 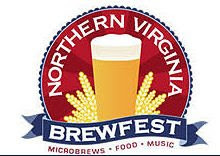 At the upcoming Northern Virginia Summer Brewfest, I'll be partnering with Cabot Cheese of Vermont, and hosting a Beer-With-Cheese demonstration, Saturday and Sunday June 21 and 22. From Bill Madden at Vintage 50: an ESB with Cabot's 3-year-old cheddar. From Clipper City: Loose Cannon Hop3 Ale (on cask) with Tomato Basil Cheddar. From Victory Brewing: Prima Pils paired with Cabot's Pepper Jack Cheddar. From North Coast: Old Rasputin paired with Cabot's Hot Habanero Cheddar ! There's no cost -- once you're in the festival, that is. But the tent for the demo will only seat 40 persons, so be sure to check on times, etc. I'll post more information, when I have those details. From the Fest, there's potentially some good news for fans of Tuppers Hop Pocket Ale ... sort of. Read here. The Wall Street Journal reported yesterday that the US Justice Department has approved the proposed merger of the US operations of SABMiller with Molson Coors. Even so, their combined sales will be still be less than those of Anheuser-Busch, whose sales sit at just under 50% of the US beer market. The antitrust enforcer's approval, which largely had been expected, allows the brewing giants to form a company that will control nearly 30% of beer sales in the U.S. <...> One major hurdle will be to figure out how to effectively promote both Miller Lite and Coors Light, longtime competitors in the light-lager category. The merger combines Miller Brewing Co. of Milwaukee, the second-largest U.S. brewer with about 18% market share, and Coors Brewing Co. of Golden, Colo., the No. 3 player with about 11% market share. The companies aim to pare $500 million in costs over the first three years of the venture, in part through lower transportation costs derived from using each other's breweries to make each other's beers. As one company in the U.S., Miller and Coors will also have more leverage with retailers, which could help them garner more shelf space at bars and stores. The Justice Department said in a statement that it determined the joint venture "is not likely to lessen competition substantially." It said cost savings the companies are expected to gain from the deal are "likely to have a beneficial effect on prices" for consumers. A friend laughs at this electronic 'braintrust' in my office, that is, my car. But, along with the portable desk that sits usually strapped into the passenger seat, these are essentials for this many-miles-driving beer salesman. For the long trips, I listen to audio books on the Creative mp3 player, which I purchase either from Audible.com or from eMusic.com. Audible, longer in the audio books market, has the larger collection, but eMusic releases its books in the non-proprietary mp3 format. Not pictured: my 'hands-free' for the cell phone. Don't talk without one. If only beer were gas.